JP 2013-05-15 ¥600 with tax ? 3D Sonic the Hedgehog (3D ソニック・ザ・ヘッジホッグ) is a remake of Sonic the Hedgehog developed by Sega and M2 for the Nintendo 3DS and released worldwide in 2013. It is the third in a series of "3D" remakes of older Sega games for the 3DS, following 3D Space Harrier and 3D Super Hang-On. Additional features include 3D effects, the inclusion of the Spin Dash, Level Select available at the start without a cheat code (called "Special" Mode), A filter to display the game with a CRT-style look with blurred colors (no 3D), customizable controls, the choice between the Japanese and International versions, and the option to hear the sound using a Mega Drive or Mega Drive 2 style. The Japanese version is Rev. 01, along with changing spike damage behavior to act like Sonic 2 and later (like in Sonic Mega Collection); the International version is Rev. 00 with no modification to spike behavior. The Spin Dash is slightly different from usual, as Sonic can still be damaged by collision with a moving Badnik while charging the move. In early 2017, Sega announced Sega Ages for the Nintendo Switch which is a follow-up to 3D classics series that adds more features and online play that will release this August of 2018 in Japan. 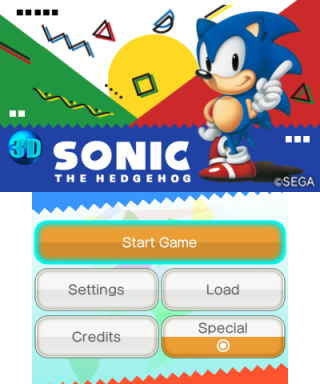 Sonic The Hedgehog (Sega Ages) was announced as one of the launch titles for this new line. This page was last edited on 20 August 2018, at 17:31.